When Nino came out of hospital for the first time, we paid a lot of visits to the supermarket. During those early weeks, he wasn’t supposed to come into close contact with anyone other than immediate family due to the risk of infection before the big op, but walking outside or round the shops was allowed. I can remember spending a lot of time shopping for and preparing elaborate family meals with our baby boy in his sling, slumbering away or inquisitively watching my every move, still at that stage where he was far too small to grab at things or get in the way of my master chef-ly endeavours. Fast forward a few months and trips to the shops became something of a game. Since he’s been able to sit upright, Nino has adored riding in the supermarket trolley, eating segments of satsuma, bits of bread, banana or – on one occasion when I swear looked away for less than a second – a (generous) corner of a pat of butter and waving at the checkout assistants. Easily as entertaining as a visit to the local soft play. We’d roll around the supermarket, me feeling not-so-secretly smug at my super mum ability to multitask and Nino beaming as we went about our business. And then Nino learned to walk. And to worry where I’d gone if I left him in the car for even a nanosecond whilst unloading bags of shopping. Since being back at work, going to the supermarket has become something of a mammoth task, taking up too much of our precious free time as I ferry heavy bags and an even heavier toddler back and forth. So I decided to try online shopping. And I’ve fallen a little bit in love. I’ve gone from someone who dismissed online food shopping as a lazy way out, inferior for not being able to select the produce you want and potentially less green to an irritating evangelist. I’ll tell anyone who listens how pleasing and efficient the whole process is. I actually enjoy browsing the digital shelves and booking in my order. Maybe it’s an age thing, maybe it’s being a parent, but I’ve finally realised that letting other people doing a little bit of the legwork to make my life easier is pretty great. Less time in the supermarket means more time for browsing the local shops in person, taking Nino on that long overdue trip to the zoo, spending time cooking rather than procuring ingredients. All of which has little to do with these doughnuts, other than that I whipped them up last week in the time it might have taken to drive to the shops. Oh and the ingredient list calls for pistachio paste, which might be tricky to find locally but is readily available online. 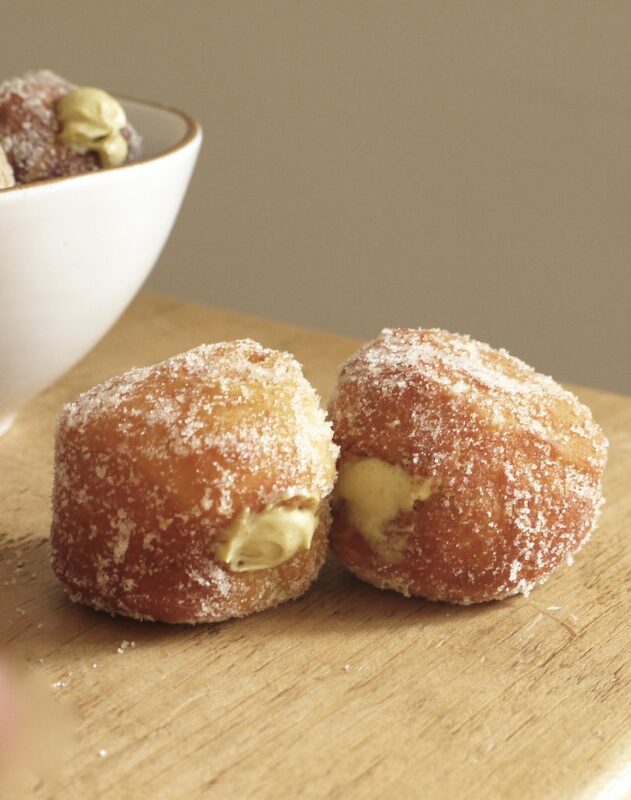 Lip smacking, deep fried, sugary goodness that only a real doughnut can deliver, perfect for a weekend celebration but equally delicious as a mid week treat. Happy Wednesday. 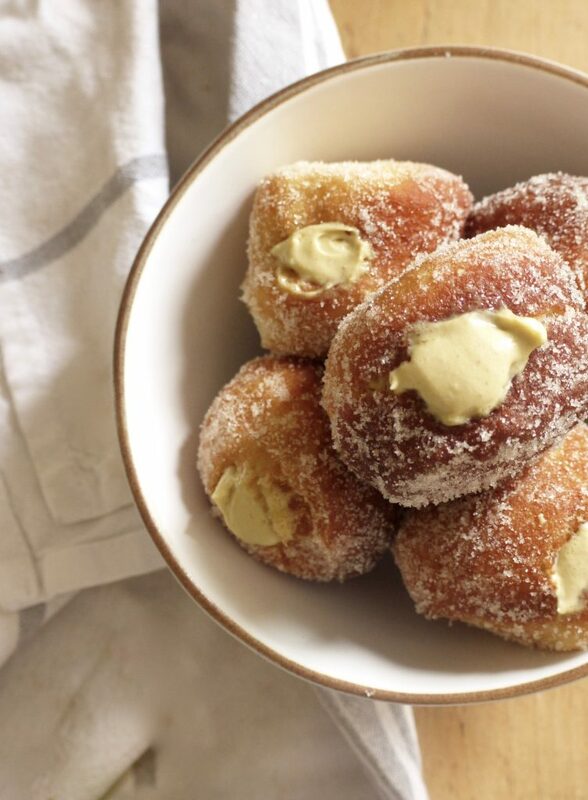 Crisp, golden doughnuts filled with a sweet pistachio cream. The perfect afternoon pick me up or a delicious dessert, you could try replacing the pistachio paste with peanut butter or even Nutella. Start by making the pistachio cream. In a small saucepan, whisk together the sugar, corn flour, egg yolk, pistachio paste and salt. Gradually whisk in the milk until you have a smooth mixture, then place the pan over a medium heat and bring to the boil. Boil for one minute, stirring constantly, until thickened, then strain through a fine mesh sieve into a small bowl. Cover with cling film to prevent a skin forming and leave to cool at room temperature. Once cool, fold in the whipped cream, then store in the fridge until ready to use. To make the doughnuts, sift the flour and salt into a large bowl, then lightly rub in the butter with your fingertips. Add the yeast and 1 tbsp of the sugar, then make a well in the centre. Mix together the egg and milk, then pour into the well. Bring the mixture together to make a soft, sticky dough then knead on a lightly floured work surface until soft and silky, 8 – 10 minutes. Lightly grease a large bowl with sunflower oil, place the dough inside then cover with a tea towel and leave in a warm place until doubled in size, around 1 hour. Once the dough has proven, press it out to a rectangle about 2cm thick on a lightly floured work surface. Use a 5cm round cutter to cut out circles of dough, then place on a baking tray lined with parchment paper. Cover with a tea towel and leave to prove in a warm place until doubled in size again, around 45 minutes. Heat the sunflower oil in a large deep saucepan to 190°C. If you don’t have a thermometer, drop a small cube of bread in to test the temperature – it should brown in about 30 seconds. Carefully place doughnuts into the hot oil using a slotted spoon, adding no more than 5 at a time. Fry for 30 – 60 seconds on each side until golden, then remove with a slotted spoon and drain on kitchen paper. 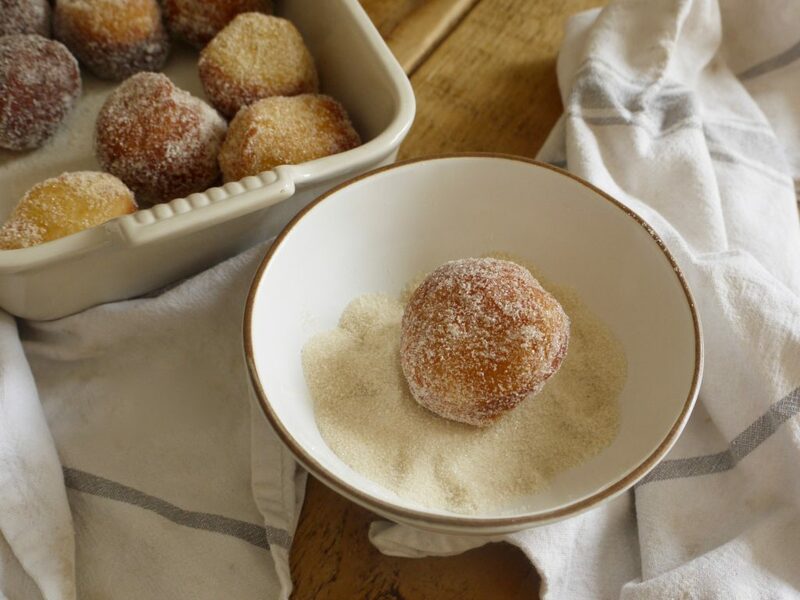 Toss the still-warm doughnuts in the remaining caster sugar until completely coated. Allow to cool, then use a sharp knife to cut an incision in the side of each one and spoon or pipe the pistachio cream inside. 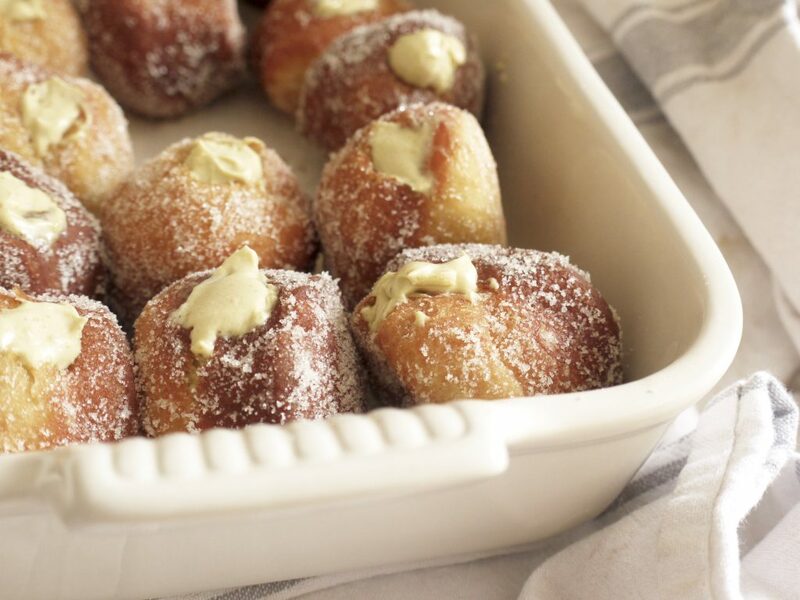 These doughnuts are best eaten on the day of making, although they will last in an airtight container for a couple of days. I am so with you on the online shopping! I still go to the store to choose my own produce, but my big weekly shop of basics and anything heavy I order online. We don’t have a car and I got sick of schlepping home heavy bags. These doughnuts look delish. 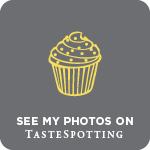 I admit I’ve always been a bit shy of deep frying, but this is the 2nd doughnut post I’ve seen lately that has got me thinking it’s time to try. Oh I do love a good online shop, cup of coffee, list of meals I want to make and all the deals easily laid out in front of you – the problem is over-ordering or somehow making a shop for one turn into £40 with no booze! 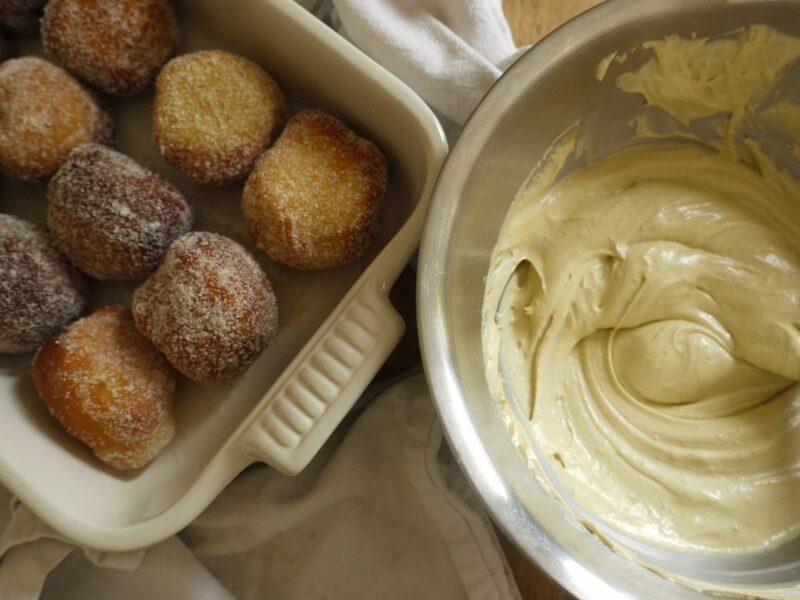 Love the sound of these doughnuts, pistachio cream sounds amazing. I love online shopping, so efficient. These donuts look amazing too. Kate these look and sound like heaven! I adore anything pistachio-flavoured so these are right up my street. Have you ever tried making your own pistachio paste? Hallelujah to online shopping and even more so to these doughnuts! These look beautiful. I love the taste of pistachio, but the colour is equally cheering.